Annette Terry Rainwater, 86, of Orlinda, passed away on Saturday December 15, 2018 at Alive Hospice Skyline Madison Campus. A private family graveside service was conducted in the Providence Cemetery in Franklin, KY. The family will receive friends for a time of food and fellowship in celebration of Mrs. Rainwater's life on Thursday December 20th from 12 noon until 2:00 p.m. in the fellowship hall of Orlinda Baptist Church. 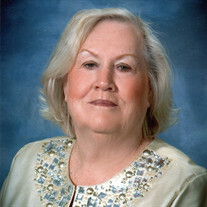 Mrs. Rainwater was born March 17, 1932 in Marion, AL to the late Grant Terry and Inez Wade Terry Smith. She was a homemaker and a member of Orlinda Baptist Church. Mrs. Rainwater was an excellent seamstress. She enjoyed making curtains, but especially enjoyed making clothing for herself and for her family. She enjoyed gardening, fashion, and collecting jewelry, especially antique jewelry. She always had an artistic flair. In addition to her parents, she was preceded in death by her husband: Alton Ray Rainwater, and by her siblings: Billy Terry, Minnie Sue King, L.V. Terry, and Melvin Smith, Jr.